Myra McEntire: Melissa de la Cruz: Friday in the Fort! Melissa de la Cruz: Friday in the Fort! I'm so happy to welcome Melissa de la Cruz to Friday in the Fort! Read her interview and then enter below to win a copy of BLOODY VALENTINE from Disney*Hyperion (THIS CONTEST IS NOW CLOSED)! About Melissa: Melissa de la Cruz is the New York Times and USA Today best-selling author of many critically acclaimed and award-winning novels for teens including The Au Pairs series, the Blue Bloods series, the Ashleys series, the Angels on Sunset Boulevard series and the semi-autobiographical novel Fresh off the Boat. Chicken katsu-don. It's Japanese fried chicken cooked in egg served on rice. There's a Japanese restaurant near our house that serves a version that tastes exactly like the one I used to eat in college. I think comfort food is always about returning to a "comfortable" time in life. Which is why Filipino food is also very comforting to me, as it reminds me of home. But for some reason chicken katsu-don is my go-to comfort food because in college my roommate and I used to order it after finals. So now when I'm on deadline I eat it and I feel better. Cold champagne in a hot jacuzzi. I don't ski or do any winter sports nor am I sporty in any way. Terrifically uncoordinated, really. If you had to choose Snuggie, which color would you pick? I own two Snuggies. Royal blue and Leopard print. Intellegentsia cappuccinos made by cute suspender-wearing baristas with interesting facial hair. Ghost story or no? Do you remember any from slumber parties past? Yes. Ghost story definitely. I always liked the one where the young couple is making out in the car and then you hear something on the roof and it's a claw or some kind of hanging man. Or the one where the babysitter gets the call from the creepy serial killer and it's COMING FROM INSIDE THE HOUSE. Both. But I do think I preferred Dares a lot more. Thank god I grew up in a time without Facebook. I read the New Yorker profile on Elvis Costello and it reignited my love for his music. I spent a lot of college sitting around, listening to Elvis Costello and singing along to "Alison" and "Almost Blue" and "I Want You." Elvis spoke to yearning, angsty teens like myself and my roommate. I still remember her saying, "Oh, sing it, Elvis." because we were so young and angsty and we kind of knew we were being so ridiculous and over-the-top, and so was his music, but we still loved it. Like, no one is THAT angsty, are they? It's a nice phase to revisit once one has grown up and matured a little. So yes, definitely Elvis Costello in the fort. Probably all three of Peter Jackson's Lord of the Rings. Whenever that movie comes on, we just watch it, no matter that we have seen it a hundred times before. Same with Star Wars. Who's the ideal mascot (usually cute boys, or one time, a unicorn, and that other time, Sue Sylvester) for The Fort and why? Tim Gunn? Because he always looks so dapper. We need more dapper! If awake all night, innocent practical joke or no? Practical jokes, definitely, but not mean ones. But are there jokes that aren't mean? I guess it depends. My friend Gabe used to pass out all the time at parties and we would write on his face and do all sorts of silly things but he always took it well and we all laughed about it. Laughing WITH and not AT is a good thing. JK Rowling hands down because she is so much fun. I want her to tell us about what Harry, Ron and Hermione are doing now. That's so awesome she has a snuggie! 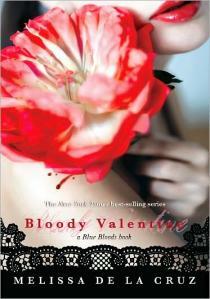 The Blue Blood Series is so good and I can't wait for Melissa's new series. I think I'm in love for the use of the word dapper!